Created in 2005 by Bob Harras and Marcos Martin, Breach was originally intended to be a reboot of Captain Atom. The publisher decided not to reboot the character but go on with the series at the last minute. Evidence of this last-minute change can be found in the firts issue when Major Zanetti is twice referred to as “Major Adams.” Tim Zanetti was a U.S. Army Major who gained superpowers in a scientific experiment gone wrong. Zanetti was working for “Project Otherside,” a secret sub-Arctic nuclear reactor where scientists were probing other dimensions. In an accident at the facility, Zanetti was caught in a dimensional rift and was afterwards found in a coma with his body forever changed. His body was placed in an isolation chamber for the next twenty years, at which point he awoke. His body had become a conductor for a mysterious and deadly energy, able to “melt” biological substances with only a touch, and so he had to be dampened with a special containment suit (similar to the Silver Age Captain Atom). Left behind while Zanetti was comatose and presumed dead were his wife Helen and son Tate. 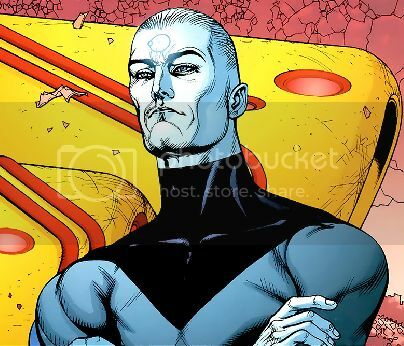 Upon his awakening, he discovered that his former colleague, Major Mac McClellan, had taken his place in his former family, marrying Helen, and had risen in the military to the rank of General (like the Modern Age Captain Atom/Angela/Eiling triangle). General McClellan told Zanetti that his family had died the very moment he came to contact with the rift. McClelllan planned to use Zanetti, now using the name “Breach,” as a tool against invasion by the race of transdimensional creatures called the Rifters. Breach appeared to die in Infinite Crisis #7 when his shell was ruptured. He vanished in an explosion, only to be replaced by the Modern Age Captain Atom. Breach resurfaced in Countdown: Arena, where he was killed by Monarch.